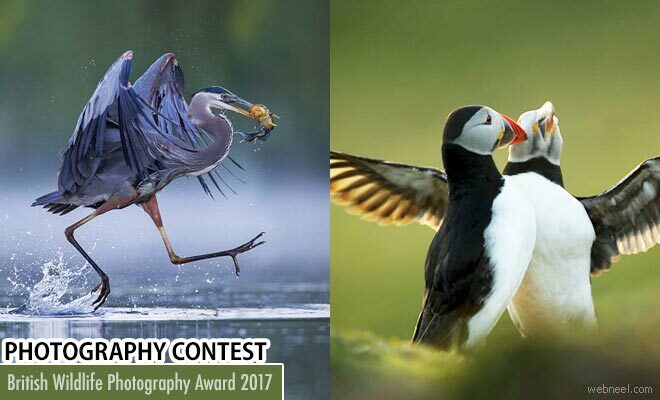 The British Wildlife Photography Awards is open for entries for the year 2017. A wide exposure of reaching millions in the media and showcasing through exhibition and book. The award is open to amateurs and professionals. The motive of the contest is to bring out the diversity of British natural history - a celebration of british wildlife through lens. Winners and commended entrants will be invited to an exclusive awards ceremony in London. There are fifteen separate categories including animal behaviour, urban wildlife,habitat,wild woods,animal portraits, marine life , the hidden secret world that lies in the undergrowth. There are two junior categories - to encourage young people to connect with the nature through photography. The winning pictures and best entries will be included in a touring exhibition across the UK and a stunning coffee table book. The title of British Wildlife Photographer is given to the photographer whose single image is judged to be the most striking and memorable of all the entries. The photographer of the overall winning image is awarded a first prize of £5,000.